The early universe was hot and dense. Baryonic matter was highly ionized and consisted of bare nuclei and free electrons, a state known as plasma. Then as now, photons were far more numerous than either nuclei or electrons. As a consequence of photon-electron scattering, the plasma and photons were tightly coupled into a single fluid whose pressure opposed gravity. This situation pertained during the first 400,000 years after the big bang. At that point the temperature had dropped to 3000 kelvin, the electrons and nuclei combined into neutral atoms which decoupled from the photons, and baryonic matter fell into gravitational potential wells of the dominant dark matter. Primordial density perturbations on all scales arose shortly after the big bang and later seeded the formation of structure from galaxies to superclusters. The density perturbations excited baryon acoustic waves, essentially sound waves, that propagated through the primordial plasma at about half the speed of light prior to decoupling. 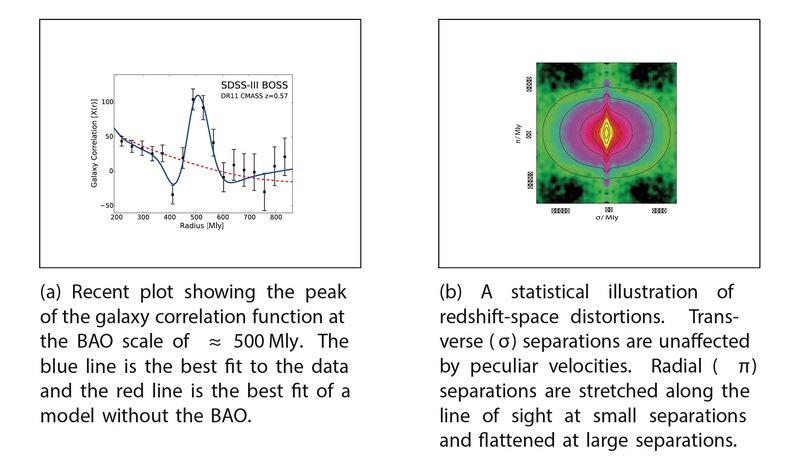 After decoupling, these waves ceased propagating, thereby imprinting a well-defined length scale of about 500 million light years on matter density correlations at the current epoch.